BCU iPad Pilot | … boldly going where no Charger has gone before! In her Royal Collection at Windsor, Queen Elizabeth has a collection of drawings of human anatomy, done by Leonardo da Vinci, each of which has been digitalized and included in the Leonardo da Vinci: Anatomy app by Touch Press. This amazing app includes the 268 pages from da Vinci’s notebooks, in high resolution, which looks fantastic on Apple’s third generation iPad. 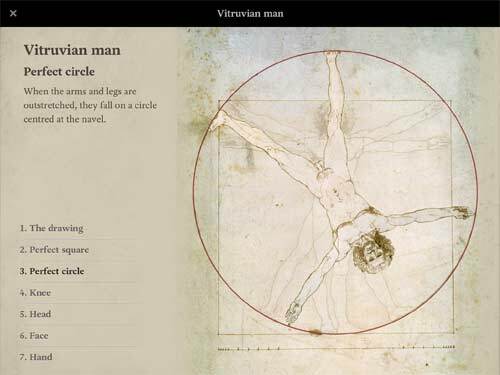 For the first time, iPad owners can explore the scientific and artistic genius of Leonardo da Vinci right on their iPads. 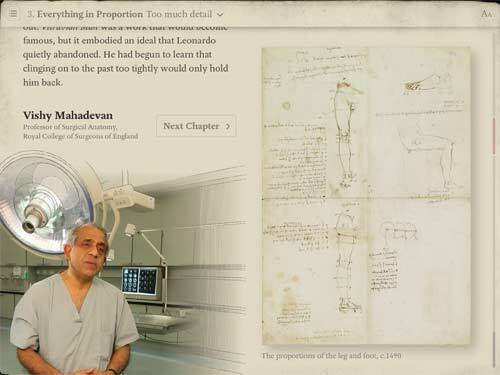 When opening the app, you’ll be taken to the table of contents, which displays the story of da Vinci, from his origins to his scientific research, along with a section for all of his famous drawings. The background of the app is gorgeous, in an aged parchment color that fits in perfectly with the content. 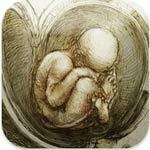 The story of da Vinci and the information available in the app is well written, straight forward, and easy to read. You can use this app in landscape or portrait mode, though it functions better in landscape mode. There’s quite a bit of content to go through, so expect to spend quite a few hours with this app. I know I did. Many people know that da Vinci was a gifted painter, but are unaware of his other interests. This app gets into the depths of his character and his love of science, making it the perfect app for students learning about da Vinci, or adults who want to know more about his life. Navigating through the app is a simple task. Scrolling down will allow you to automatically progress through each chapter, and when you reach the end of a chapter, it will transition to the next one. Every chapter comes with pictures that can be tapped to view larger, and a video that is embedded into the page. You can tap to pause it and to play it again. There are a total of eleven chapters filled with content, and in when you’ve read everything, you can transition to viewing all of the drawings. The drawings are separated into sections, including animal studies, early works, chalk, pen and ink, and ultra violet light, among others. You can choose to browse by these sections, or flip through all of the drawings at once. Each drawing is presented in its original form, but also accompanied by a translation so that you can read the text on each page. There’s also a mirror function that will decode da Vinci’s famous mirror writing, where he wrote backwards. Reading through da Vinci’s notebook is truly fascinating, and this is app is perfect for anyone with even an inkling of interest in his drawings. What I liked: This app is cleverly designed, and I loved the way that it integrated media, like video, seamlessly into each page. I also enjoyed the interactive drawings. What I didn’t like: This app is enormous. It’s a 1.70GB download, which takes up a lot of space on the iPad. I suppose that can’t be helped though, with so many gorgeous, high resolution drawings. To buy or not to buy: This app is great for students and adults alike. It’s a must have for anyone that’s fascinated with the works of Leonardo da Vinci. Time-Lapse footage. You can click on the speed of the video. Watch ‘Solar Dynamics’, “Ocean Chlorophyll’, ‘Plant Growth’ or ‘Bees’ among others. Note: This site only works on Google Chrome and Apple Safari browsers. Padgadget revisits a middle school after using the iPad for 5 months. Yes, I know this is a middle school iPad usage review – but maybe some of these can be adapted to college level, enjoyed by your kids/grandkids, or put to use by the Education majors. I used Socrative last fall, but at the time it was only available via a web browser. It claimed to handle up to 50 simultaneous users, but we often had trouble with anything past 10. People simply were not being allowed to connect to the material, or it would take an excessive amount of time to connexct when I wanted to use it for a quick assessment of student understanding. I might have to check out their apps to see if they function better. Want to Create A 3-D Action Figure of Yourself? Get out your iPad! Check out this Padgadet Story about AutoDesk. Be sure to watch the embedded video in the article. Trekkie Fans: Can ‘holo-suites’ be far behind? Next time you read a novel, pay attention to all the references to celebrities, books, foods and even clothing brands. There could be many more than you might expect. Intrigued? Check out Small Demons (free sign up required) An online database of the people, places and things referenced in literature throughout the ages. I typed in Vivaldi – he was referenced in 2 books. I typed in Pepsi – it got more than 500 nods. Padgadget has a review on an app adaptation of some of E. A. Poe’s works. From the review: “… a Spanish developer Play Creatividad‘s offering iPoe – The Interactive and Illustrated Edgar Allan Poe Collection is of such high quality that it underscores the strength of Poe’s material, while highlighting the strengths of reading a digital, interactive story.” The app is $3.99 – here is the link to the App Store.